There is no airport hotel at Ngurah Rai, but with its location right on the beach at the south end of Kuta beach, there are a wide range of accommodations available just minutes away. Many people mistakenly assume that since the airport code is for the city of Denpasar, that the city is closest to the airport. In fact, Denpasar is quite some distance away, and doesn't have very many hotels as well. If you want to be near the airport on your way into our out of Bali, then you want to look for places in Tuban or South Kuta. The list below is a selection of hotels we've actually stayed at near the airport. Among them, the Harris is the closest, and a rather nice hotel with a somewhat out of the ordinary 'retro' design. There are in fact very many hotels near the airport. 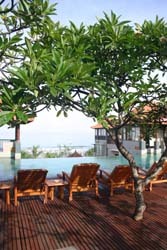 You can view a list of all the hotels in Bali that can be booked online by name, price, class ('stars') or by district.